Monique Pairis-Garcia, Assistant Professor in the Department of Animal Sciences, wants to create a consistent experience for her students across their courses. She wants her students to focus on learning the course content rather than spending their time digging for the materials they need. She found a simple way to accomplish these goals—adopting a home page template that can be used across CarmenCanvas courses in her department and other areas at The Ohio State University. 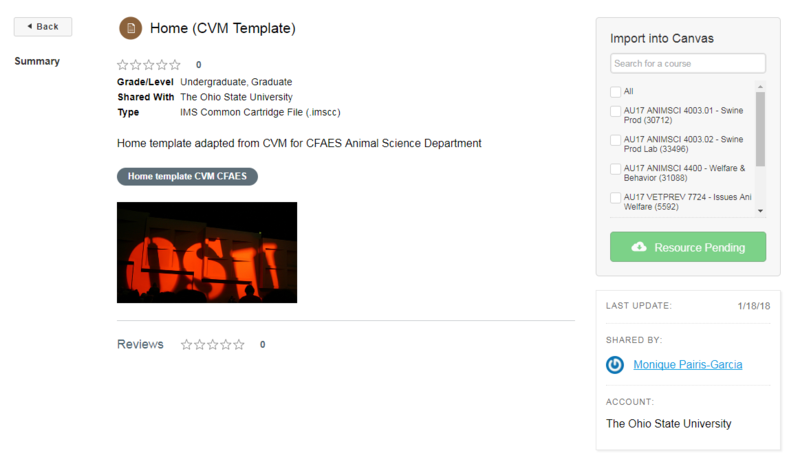 The template was originally created by instructional designers in the College of Veterinary Medicine, but now the home page design is making its way to CFAES in the Animal Sciences Department. With the template in place, students will be able to find course items in the same location for each course they take in that department. For example, students can expect the syllabus to be in the same place in each course, they will know where to find the class schedule and they can easily navigate to modules and assignments. They will also be able to find contact information for their instructors and TAs. Pairis-Garcia is using this home page template in her courses and is gaining buy-in from other instructors in her department in hopes to make this consistency a reality for Animal Sciences students. Feedback from students on the home page and overall course design have been very positive. Pairis-Garcia shared that her students like having the syllabus linked on the home page, and they appreciate that modules are organized by week. Pairis-Garcia suggests starting with a template created in your college or adapted from the Canvas Commons. The template she used is available in the Commons for others to import and customize to fit the needs of their courses. You can find this template by searching “Home (CVM Template)” in Canvas Commons, as shown below.